There are precious few Hollywood remakes that go on to achieve international cult status, but that's certainly been the fate the story of Cuban immigrant turned high powered gangster that was Brian De Palma's 1983 remake of Howards Hawks' 1932 gangster classic, Scarface. In the spring of 1980, the Mariel boatlift brought thousands of Cuban refugees to the sun-washed avenues of Miami in search of the American dream. From acclaimed director Brian DePalma, Scarface is the rags-to-riches story of Tony Montana (Al Pacino), who finds wealth, power and passion beyond his wildest dreams…at a price he never imagined. Tony Montana's meteoric rise, lavish life and soul-destroying fall anchor an epic film that inspired a worldwide following. Pacino is at his most memorable as Montana, blasting his way to the top of Miami's drug underworld in a bravura performance. A masterful collaboration between acclaimed director Brian de Palma and screenwriter Oliver Stone, Scarface features extraordinary performances from a cast that includes Al Pacino, Michelle Pfeiffer, Mary Elizabeth Mastrantonio, Robert Loggia, and Steven Bauer. The film was nominated for three Golden Globe Awards (including Best Actor, Best Supporting Actor and Best Original Score), and was named one of the Top 10 Gangster Films of All Time by the American Film Institute. 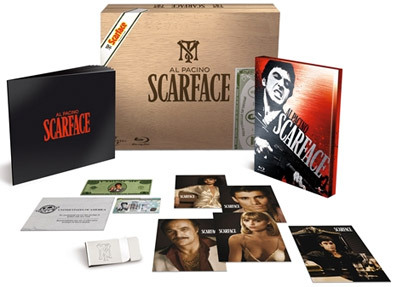 On 5th September 2011, Scarface will make its Blu-ray debut as a triple-play release containing Blu-ray, DVD and digital copies of the film, and a boat-load of extra features. The disc will also be available in Steelbook and Cigar Box Collector's Editions. The RRP is £24.99 for the triple-play, £29.99 for the Steelbook Edition and £59.99 for the Cigar Box Collector's Edition. The Scarface Phenomenon – an all-new documentary that explores how a film plagued by controversy leading up to its release has become a Hollywood classic, influencing a whole new generation of filmmakers and leaving a lasting imprint on popular culture. The World of Tony Montana – Experience the world of the ultimate gangster and hear from experts on the real world violence, fear and paranoia that surrounds a drug lord. The Rebirth – Director Brian De Palma, producer Martin Bregman, actor Al Pacino, and screenwriter Oliver Stone revisit the history of Scarface, from the inspiration of the original Howard Hawks classic to the evolution of the script. The Acting – Join the filmmakers, Al Pacino and Steven Bauer to discover how each of the roles was cast and how Brian De Palma worked with his actors to get unforgettable performances. The Creating – A fascinating, controversial and definitive journey through the making of the film, which began with the production being forced to leave its initial location in Florida. Discover how the chainsaw scene was filmed, learn about the production design, the photography, and the struggle to get the film an R rating in the US. Scarface: The TV Version – A revealing and hilarious montage of film clips comparing the theatrical version to the network television version of Scarface. The Making of Scarface: The Video Game – Immerse yourself in the world of Scarface in this behind-the-scenes look at the creation of the video game. Scarface Scoreboard – Watch Scarface like never before. Keep track of the number of times the F-word is used and monitor the bullets fired! Picture in Picture – Available in English with subtitles in French, Italian, German, Spanish and Japanese. Access interview footage of Brian De Palma, Al Pacino, Screenwriter Oliver Stone, and others without interruption to the movie experience. Also featured is a scene comparison between the 1983 version of Scarface and Howard Hawks' original film. BD-Live – Access the BD-Live Centre through your Internet-connected player to get even more content, watch the latest trailers and more. To mark the Blu-ray debut of Scarface, Al Pacino, Steven Bauer, Robert Loggia, F. Murray Abraham and producer Martin Bregman gathered with a host of Hollywood stars at the decadent surroundings of The Belasco Theatre for a special promotional night. Guests relived the explosive power of the film that redefined the gangster genre forever, as Universal Pictures International Entertainment reunited the cast and creators of this iconic underworld epic for a unique presentation. Audiences were also treated to an exclusive performance from three-time Grammy award winning rap artist Ludacris during the packed after-party. You can see video highlights of the event above.